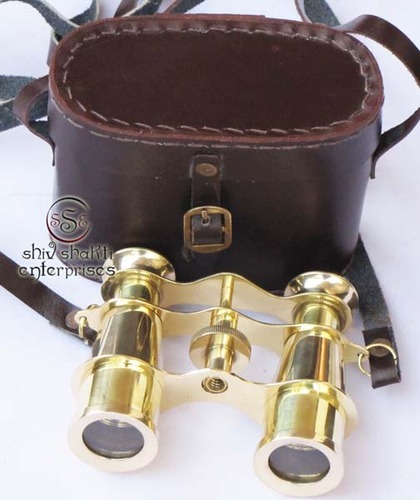 Attractive nautical brass binocular.Used to view distant objects using binocular vision. We offer high quality nautical reproduction handicrafts such as nautical binoculars. Our organization is one of the prominent manufacturers, exporters and suppliers of all kinds of Armor Helmets and Nautical Items. Our comprehensive range of products consists of Nautical Clocks, Brass Statues, Nautical Compass, Brass Sextants, Fire Helmets, Binoculars, Telescopic Expendable Arm, Helmet, Statue, Shree Yantra, Bell, Compass, Diving Helmet, Sextant and Antique Helmet. The products manufactured by us are used for diverse purposes including dispatching in industries, in rock climbing and diving equipment and as decorative Items. These have been appreciated for characteristics like robustness, reliable operation and lasting. Our team of experienced and sincere personnel works persistently to manufacture high quality instruments for our clients. Quality is of utmost importance to us, which is why we ensure that we use the finest quality raw material including brass, steel and Iron. Apart from this, our quality controllers carry out regular tests on our range, which in compliance with the international quality standards. Our organization also provides extensive customization solutions, which includes the manufacturing of our range in line with client specifications. Our excellent customization facilities and prompt delivery services have enabled us to garner a vast clientele based in regions comprising Europe, Australia, Middle East And USA.